Logo Golf Shirts - These basic Elemental Golf shirts are the perfect way to showcase your brand! These shirts are cost effective, quality and sure to impress! This shirt comes in a wide range of colours and is manufactured in Africa. The Men's Elemental presents the perfect blank canvas for any promotional campaign in South Africa. Logo Golf Shirts - Looking for a great quality golf shirt that comes in 11 different colours and has a large stock holding? Elementary, my dear! Literally! Brand Innovation supplies the US Basic Elemental golf shirt in South Africa. It’s the perfect cost-effective golf shirt. It comes in men’s and ladies fit, and is one of our most popular golf shirts. Collared Golf Shirts are a fantastic way to look smart and feel comfortable. It’s that collar that gives it the balance between a formal work shirt and the more casual t shirt. US Basic is a brand that focuses on the essentials. Like a beautiful golf shirt that you can use to promote your brand. Be it as a promotional golf shirt, or a corporate uniform, these golfers are an awesome way to keep your brand front and centre. Branding on Golf Shirts can really make your uniform. It quickly and easily identifies your employees, and can even help to encourage team spirit. Embroidery is a particularly great way to brand clothing, especially golf shirts. Embroidery is using coloured thread to stitch your logo onto the garment. We charge for embroidery based on how much thread is used in the design, or ‘per stitch’. This is a great, permanent way to brand your corporate uniforms. It adds an extra element of texture to your golf shirts, and looks high end. Many people tend to shy away from embroidery because of the cost of it. But you don’t need to do that with this shirt. Ask your Account Executive if your shirt qualifies for our free 10cm x 10cm chest embroidery. That way you can have all the high-end appeal of an embroidered golf shirt for your brand. 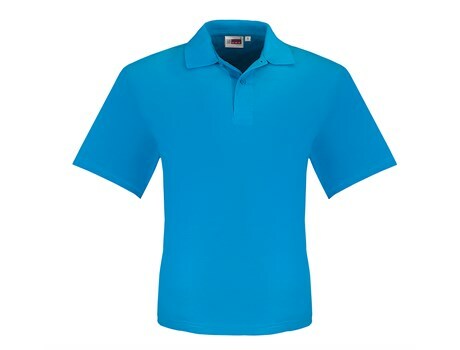 Buying Golf Shirts Wholesale works out to be a more cost-effective exercise overall. It gets you the best price for the most product. And when you’re buying for a whole company then that’s exactly what you need. The US Basic Elemental Golf Shirt is one that has a lot of stock available. With a large stock holding, you can have the colours you need when you need them. Even more than that, this golf shirt comes in 11 different colours! That’s more than a rainbow! Your whole company can showcase your awesome brand with these stunning golfers. Whether you’re living it up on the sports field or in the office, these golf shirts give you the best of both worlds. So, whether it’s stylish golf clothes you’re after, or a sharp corporate uniform, this is a great choice. From the corporate jungle of Johannesburg, to the more relaxed atmosphere of Cape Town, branded corporate golf shirts, are the way to go. So why not get yourself some in bulk from Brand Innovation? We are premier suppliers of Logo Golf Shirts?